- filling that need for speed! 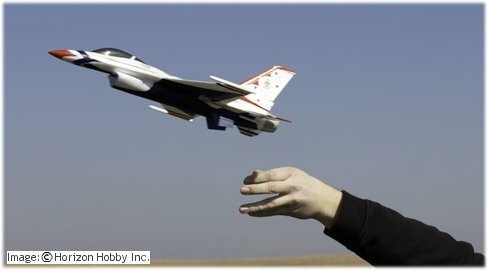 If you're looking to fly faster model aircraft, rc jets can give you the ultimate thrill and adrenaline rush! Electric powered ducted fan (EDF) jets have become commonplace on our flying fields in recent years, and they offer an excellent gateway to the more serious gas turbine powered model jets. But these turbine jets, however, are not for the beginner. They are very serious model aircraft that you have to work up to after gaining a large amount of radio control flying experience, and an equally large amount of cash. They are very serious business. The good news is that the EDF jets are more affordable and many are stunningly realistic, making them an excellent choice for those who aren't in a position to fly a turbine model. The best introduction to flying true rc jets (i.e. with no propeller) are the aforementioned jets which use an electric ducted fan unit as pictured above. A ducted fan is a small but powerful unit that houses a multi-bladed impellor spinning at very high RPM (revs/minute). As it spins, air is sucked into a duct through one or more intakes in the fuselage of the jet, and then forced out the back of the jet at very high speed, pushing the jet through the air. A lot of thrust can be generated by an EDF although this is obviously going to vary from unit to unit. EDF units are generally powered by high Kv brushless motors (high RPM) and need a high capacity/high discharge rate lithium polymer battery pack (Li-Po) because of the high current that they draw. As previously mentioned, Ready To Fly foam EDF jets have really taken hold in recent times and the number of good quality RTF EDFs available has increased dramatically, to the point where it's as common to see such a jet on the flying field as it is a plane or helicopter - that wasn't the case a few years ago when rc jets were very specialised models. Foamie EDF jets like this aren't cheap and you do need to be an intermediate pilot to fly one safely - in other words they're absolutely not for the beginner rc pilot. But definitely something to work towards! It's a good testament to the hobby that electric ducted fan rc jets like these have now become so widely available and relatively affordable, in exactly the same way that electric rc helicopters have. But with that said, it's important to know that starting out in the radio control flying hobby from scratch with an EDF jet isn't wise. Gaining flight experience with a conventional trainer airplane is the thing to do; the faster flying speeds of jets can catch out the beginner rc pilot who hasn't yet developed the reactions and co-ordination needed to fly any rc aircraft type. 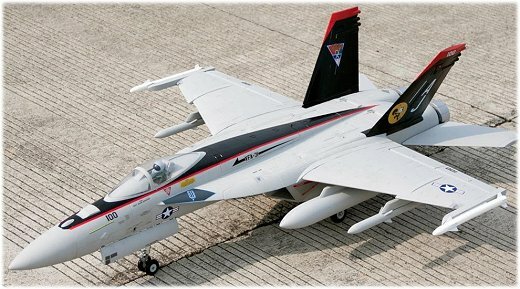 Like all other model types in the radio control flying hobby, rc jets have shrunk in size in recent times. Leading the way is the Horizon Hobby brand E-flite with their UMX range. The latest jets feature Horizon's AS3X™ stabilisation technology which helps fight wind gusts and the natural twitchiness of small model aircraft. These micro-sized rc jets are excellent fun around the park, and are quite cheap to buy. You don't really need the same level of flying experience as for a larger jet, but their relatively fast speed does mean you need to have built up the necessary reactions and co-ordination before attempting to fly one. Even a smaller size model gas turbine unit can cost a four-figure sum, and that's before you've purchased the jet, radio gear and all the essential accessories. So a twin engine model, like the Tomcat in the video, is going to cost you a lot! But rc gas turbine jets are the ultimate in radio control flying. Large scale jets look and sound amazingly realistic in the air and a properly built and well flown scale model is very impressive to watch in action. If you ever get a chance to see some of these on display, then do. RC events that feature such aircraft are becoming more and more common, and it's worth trying to locate one if you can. Top UK radio control pilot Ali Machinchy, now living in the USA and working for Horizon Hobby (a big loss to the UK rc scene! ), always puts on an amazing display and flies large scale jets - indeed, he's one of the world's top show pilots. A good quality rc flight simulator can give you a realistic jet-flying experience, without breaking the bank. I have the Phoenix flight sim which features several turbine jets. 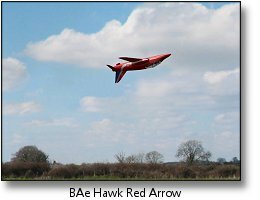 A screenshot of the BAE Hawk is shown to the right. You can learn more about rc flight simulators here. One advantage rc jets have - whether virtual or real - is that they are not so adversely affected by wind like many rc airplanes are, due to the higher airspeeds and sleeker aerodynamics. This is a big plus when you're flying, although obviously every model has its own limitations and flight characteristics. A downside is that because of this speed they need extra airspace; a faster flying model requires much more space for turns and aerobatic maneuvers than a slower flying aircraft, and you need to remember this when flying jets of any size. This consequently brings in the problem of your jet being flown at a distance where it's not always easy to see exactly what it's doing; that in turn brings the serious risk of disorientation - a proven killer of rc aircraft of all types! But flying any type of rc jet is always an adrenalin-filled experience and with radio control and electronic technology forever improving and reducing in cost, more and more rc jets will become available still, even for the lesser-experienced amongst us.